At the end of 2005, I had the opportunity to travel to Whangarei, New Zealand for residency at the Northland Polytechnic. 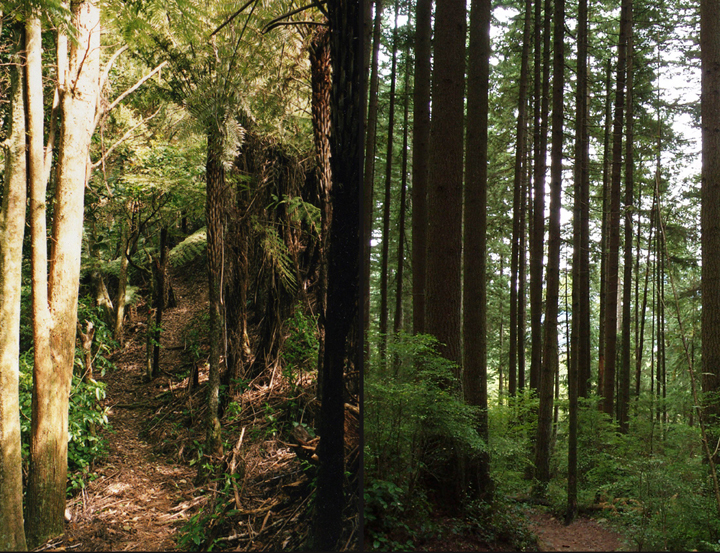 Out of this experience I created a body of work making comparisons between their sub-tropical forest and my own temperate coastal rainforest. A question often asked of visitors to this country is “what do you think of New Zealand?” A generous response is expected, “yes, very beautiful”, perhaps followed by “and the people are so friendly”. It’s an exchange that’s shaped by images that are projected out to the world and to ourselves, of “100% pure” and “clean and green”. So it’s reassuring to receive confirmation of New Zealand’s natural beauty from visitors. A recent exhibition at the Geoff Wilson Gallery by Fae Logie, a visiting Canadian artist, however, was valuable because it didn’t offer simple reassurance. Rather, it forced us to think about our relationship with nature, and the natural beauty that we appear to value so highly. Logie’s work deals with place, in this case Whangarei and the local bush. Her experience of this place was contrasted with the southern coastal forests of British Columbia in her native Canada. 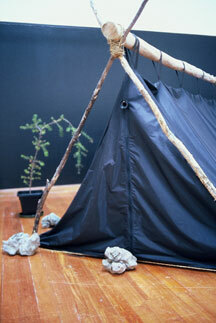 The central work was of a tent structure surrounded by small potted Kauri trees. A video was projected on to the inside back of the tent, which you could view through an eyepiece. The video showed a typical image of the lush green New Zealand bush. The soundtrack was of kiwi, a recording borrowed from the New Zealand Conservation Department. The eerie sounds of kiwi filled the gallery space. This work immediately established an idea explored elsewhere in the exhibition, a consideration of what is natural (or real) and what is an image. In this work we hear a recording of kiwi, we watch a video of the bush. The work probes the way the natural world exists for us. Is it always under the gaze and control of humans? Does nature exist for us as just a pleasant respite from our urban lives? Is the blurring of conservation and tourism unavoidable? And the sound of the kiwi in the unnatural setting of the gallery raises the ominous possibility that one day we might only have the recordings, the “national bird” will no longer exist in nature. In another work, Logie turned photos of the bark of Douglas-fir and kauri trees into fringed mats, titled ‘Aerial Rig’ and ‘Aerial Matt’. A reference to natural materials turned into products and to aerial photography that maps the land, not to mention the idea that mats are for walking on (or walked over). These works cleverly mediated on the commercial forces that threaten forests and eco-systems, but which are so easily hidden by mundane products for domestic environments. As Logie says, how much do we really care? While these issues were part of the exhibition, they were raised in a restrained way. And they coexisted with more individual responses to place and to nature. In one corner of the gallery were a series of letters written by Logie. Each one described personal recollections of forests, in Canada near where she lived and worked, and here, specifically the bush that backs on to The Quarry Art Centre, where Logie was staying. Next to the letters a map of Whangarei’s Western Hills is marked boldly with the words, “I am here now”. A statement that is confident, a declaration of certainty, but which is obviously undermined by the transience of our connection to place — and not just for a visiting artist on a three month residency. 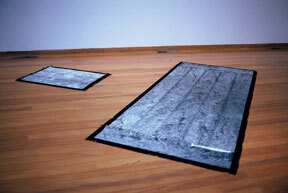 The most intriguing and difficult piece in the show consisted of two rectangle mirrors roughly framed with timber, one placed on the gallery floor, the other, directly above, attached to the gallery’s lighting frame. 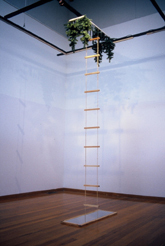 The suspended mirror was encircled with small fake Christmas trees, pointing downwards. Joining the two mirrors was a rope ladder. This work seemed to allude to the two hemispheres, the northern where Logie had come from, and the southern where she was now, with the Christmas trees representing the Douglas-fir of her Canadian home. This was perhaps more than just an acknowledgement of a connection between two places, it suggested something larger, of shared cohabitation in this world, and of shared responsibility. And if you’ve ever tried climbing a rope a ladder, one could assume that the ladder symbolized a certain precariousness. But for Logie that bond must be important, for despite the uniqueness of place it’s essential to see that we do inhabit the same world, and that we have similar feelings for nature and face similar environmental problems. An effect of the two mirrors facing each other was that if you looked into one there was a sense of peering into space that disappeared to infinity, of space and time existing beyond the boundaries of the Geoff Wilson Gallery. There was plenty in this exhibition to digest and reflect on, as we in New Zealand consider the fragility of the natural world, often under threat from economic development.